If you need pens quickly for an awards ceremony, staff incentive or as a thank you to an important customer then MrPen can deliver. As a corporate customer stated recently when we delivered 60 individually engraved pens, "that took you less time than it takes me to walk the dog". We can also imprint pens with a new form of diamond engraving. It enables us to incorporate a logo, image or special style of lettering on selected pens. Beautiful pens, carefully engraved and delivered fast. A typical product for presentation. The illustration is a fine example by the Parker Pen Company with this superb presentation case. 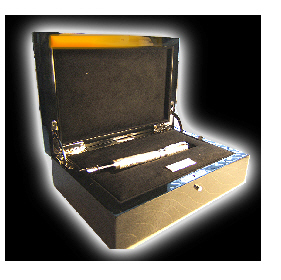 The case has been enhanced by MrPen with a small engraved brass plate inside the case. Buying a pen or more than one for a special coporate gift can present a headache to the purchaser. Our competitors often require multiple orders but with MrPen you can buy an individual pen. Pen can be engraved with your coporate logo FREE! The presentation case can have a personalised engraved plate fitted, more than one if you wish. We can even gift wrap to finish the whole presentation.